What You Need to Know About Prescription Drug Prices in the U.S.
Home Medical Care What You Need to Know about Prescription Drug Prices in the U.S. Per capita spending on prescription drugs in the U.S. is higher than in other industrialized nations, including Canada. In most industrialized countries, unlike the U.S., drug prices are regulated by the government. Centralized advisory boards determine the clinical efficacy and cost-effectiveness of a drug. 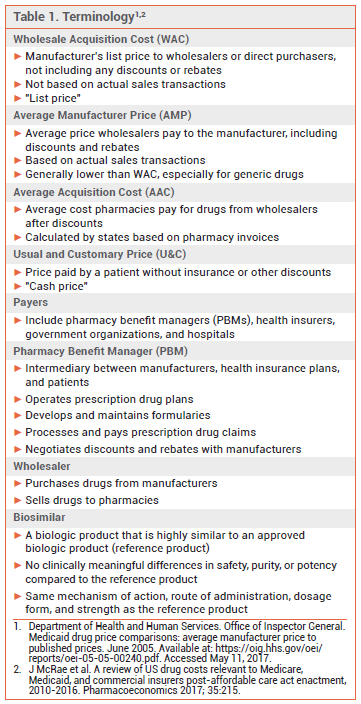 Prices are based in part on external price referencing (comparison of drug prices in several countries to determine a reference price) and are often transparent and capped.2 Fewer payers are involved, and in some countries, there is only a single public payer. Most health insurance companies offer plans that charge patients copays for prescription drugs; the copay varies depending on the insurance plan and which “tier” the drug occupies. To help patients find the lowest price for a particular drug, some websites compare prices at local pharmacies, list available coupons, offer discount prices, or search for patient assistance programs.6-8 Patients should be cautioned, however, that using different pharmacies to fill their prescriptions could increase the risk of drug interactions because prescription information is not shared between pharmacies. Patients who use online pharmacies to save money should look for those that are Verified Internet Pharmacy Practice Sites (VIPPS); these are U.S.-based pharmacies that are accredited by the National Association of Boards of Pharmacy and are considered safe.10 Purchasing drugs from unreliable foreign or internet pharmacies can put patients at risk of receiving counterfeit, contaminated, or unapproved products. 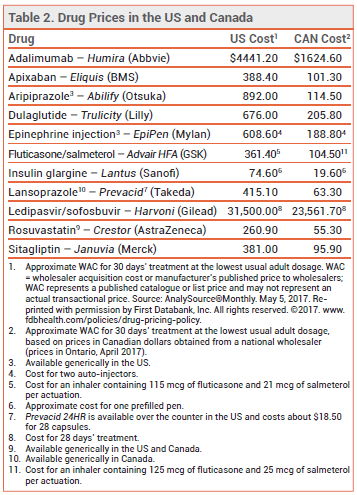 Drug prices are generally substantially lower in Canada than in the U.S. (see Table 2), but importation of drugs from Canada that are available in the U.S. is illegal.11,12 Moreover, many internet pharmacies that claim to sell Canadian drugs actually sell drugs produced in other countries. The U.S. spends more on prescription drugs than other industrialized countries. Uninsured patients and those with high deductibles generally pay the highest prices. Lower-cost generics, patient assistance programs, and comparison shopping can reduce out-of-pocket drug costs. Drug prices are lower at some internet pharmacies, and pharmacies accredited by the National Association of Boards of Pharmacy are considered safe. Drug prices are generally lower in Canada, but importation from Canada of drugs that are available in the U.S. (or any other country) is illegal. 1. AS Kesselheim et al. The high cost of prescription drugs in the United States: origins and prospects for reform. JAMA 2016; 316:858. 2. C Leopold et al. Differences in external price referencing in Europe: a descriptive overview. Health Policy 2012; 104:50. 3. A Lyles. Pharmacy benefit management companies: do they create value in the US healthcare system? Pharmacoeconomics. 2017; 35:493. 4. S Morgan et al. International best practices for negotiating ‘reimbursement contracts’ with price rebates from pharmaceutical companies. Health Aff (Millwood) 2013; 32:771. 5. A Hakim and JS Ross. Obstacles to the adoption of biosimilars for chronic diseases. JAMA 2017 May 1 (epub). 6. GoodRx. Available at: www.goodrx.com. Accessed May 11, 2017. 7. Blink Health. Available at: www.blinkhealth.com. Accessed May 11, 2017. 8. NeedyMeds. Available at: www.needymeds.org. Accessed May 11, 2017. 9. JS Ross and AS Kesselheim. Prescription-drug coupons – no such thing as a free lunch. N Engl J Med 2013; 369:1188. 10. National Association of Boards of Pharmacy. The Verified Internet Pharmacy Practice Sites (VIPPS) program. Available at: www.nabp.pharmacy. Accessed May 11, 2017. 11. S Morgan and J Hurley. Internet pharmacy: prices on the up-and-up. CMAJ 2004; 170:945. 12. FDA. Importations of drugs. Information on importation of drugs prepared by the Division of Import Operations and Policy, FDA. Available at: www.fda.gov. Accessed May 11, 2017. This was first published in The Medical Letter on 05/22/17. It has been republished here with permission. The Medical Letter, Inc. is a nonprofit organization that publishes critical appraisals of new prescription drugs and comparative reviews of drugs for common diseases in its newsletter, The Medical Letter on Drugs and Therapeutics. The Medical Letter, Inc. is committed to providing objective, practical, and timely information on drugs and treatments of common diseases to help our readers make the best decisions for their patients—without the influence of the pharmaceutical industry. Subscribe to The Medical Letter today! Thank you, very useful article. I learned a lot for myself. It seems to me that prescription drugs prices are too high. It feels like everything is millionaires. Yes, I know that there are all sorts of government programs and insurance. But agree that this is not available to all people in need. Online pharmacies are becoming more popular. Because their prices are adequate. And you can buy everything you need without a prescription. I understand that this is not entirely legal, but on the other hand there is no choice. I hope that someday things will change.